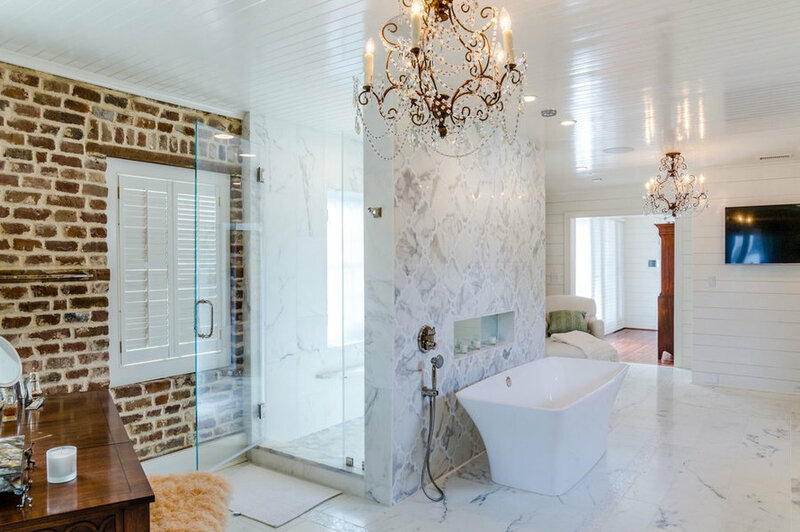 This master bathroom is located in an historic home in Charleston originally built in 1794. 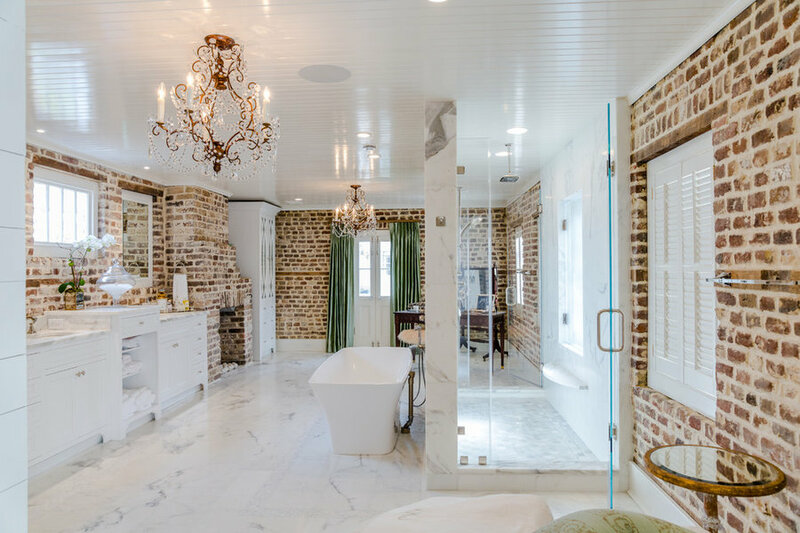 It features original brick and two (now gas) fireplaces, a walk-through shower for two and luxurious amenities including a marble feature wall and heated floors. The space was formerly two bedrooms and an outdated bathroom, with closets covering windows and both fireplaces concealed behind walls. The transformation took many months and was part of a whole-house renovation. 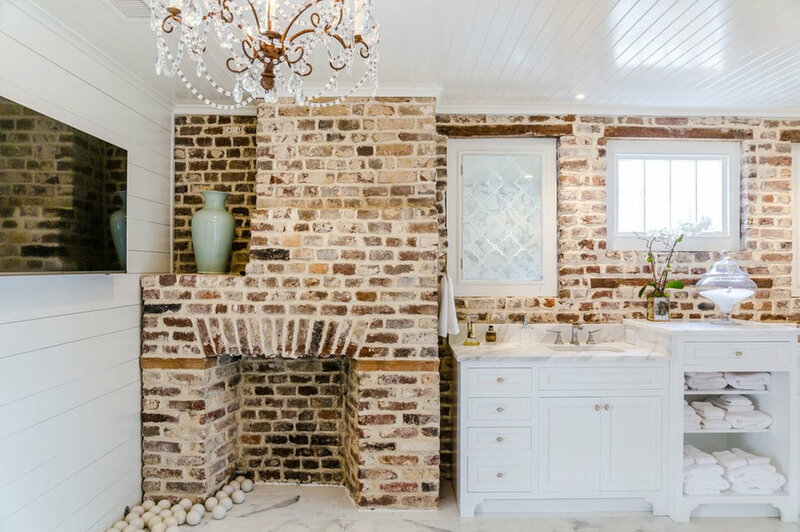 Exposed Brick and two fireplaces add charm to this luxurious master suite in historic Charleston. 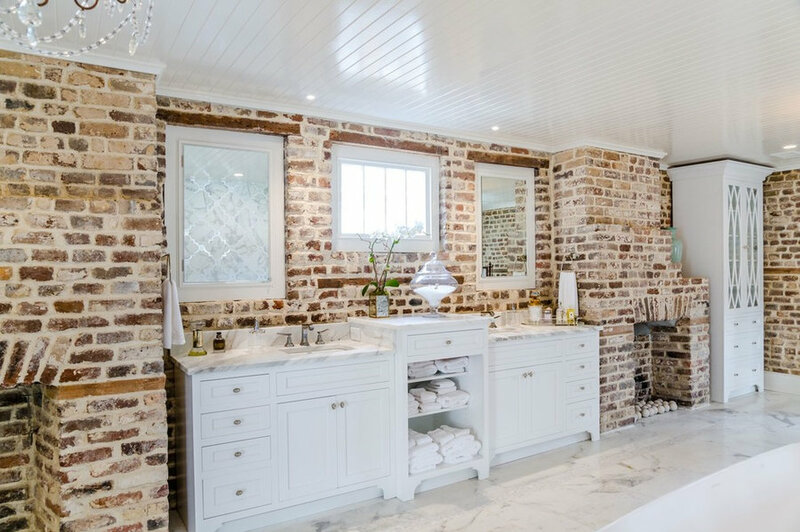 The space was formerly two bedrooms and a cramped bathroom but now is a generous bathroom featuring ample cabinetry, storage for linens and a shower for two. 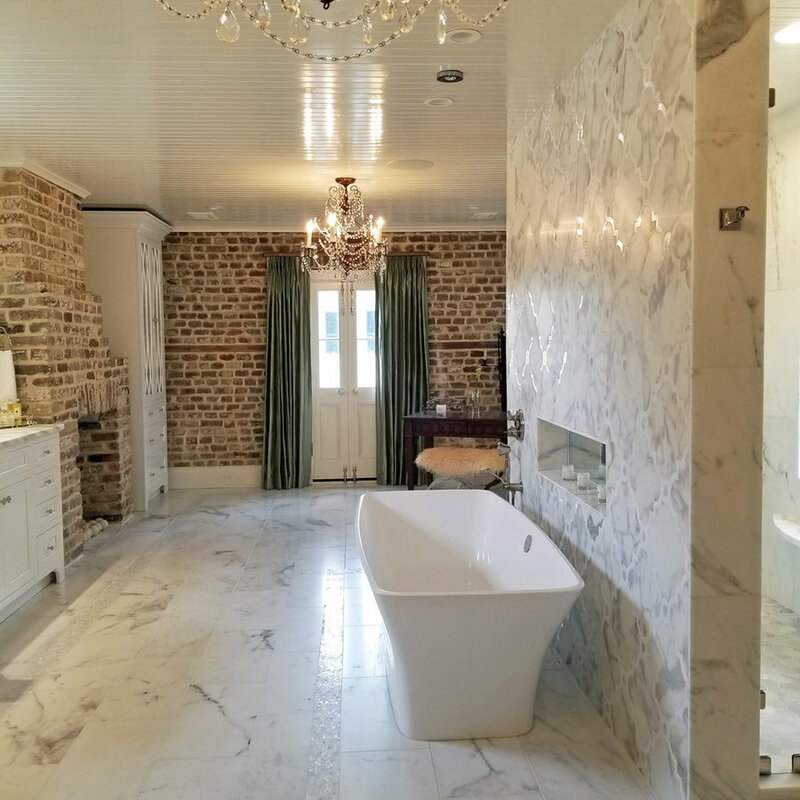 The tub fill is in the ceiling and the marble floor is heated a dramatic change from the original features of this home, which was built in 1794. 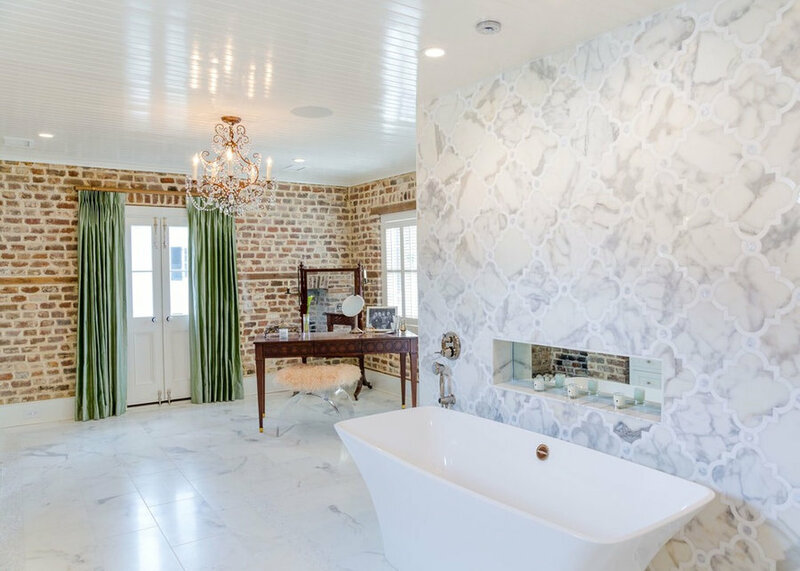 A custom tile feature wall with natural Thassos marble and mother of pearl accents is located behind the tub. The valve on the left controls the water... which fills the bathtub from the ceiling, above the free-standing tub. A recessed mirrored niche allows a resting spot for a glass of wine and candles to set the perfect mood. A double shower features multiple niches and a fog-free heated mirror. 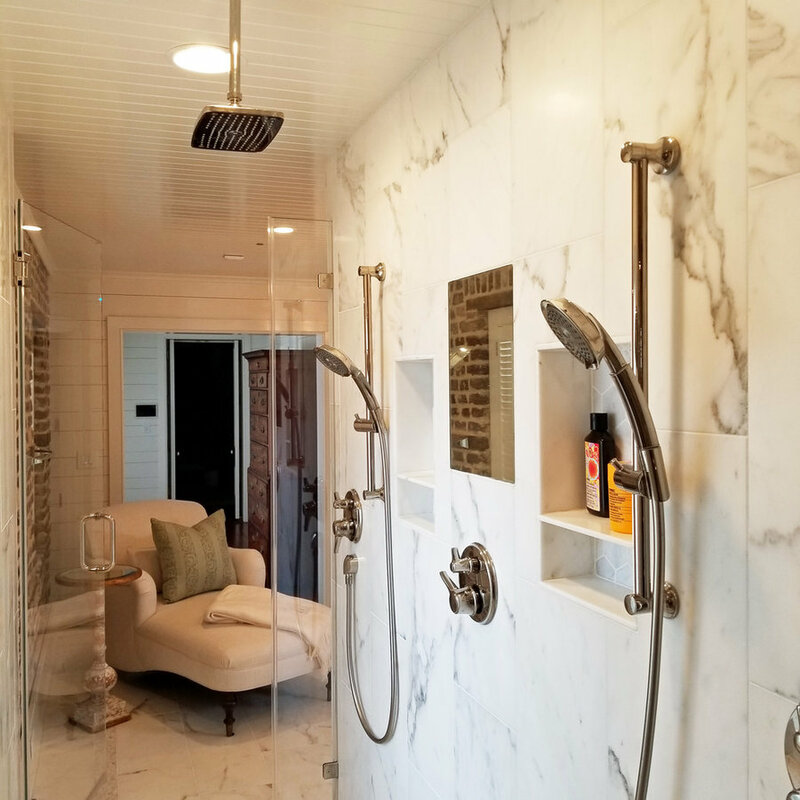 There is an over-sized rain style shower head and adjustable hand-held sprays mounted on poles, all with their own temperature and volume controls. Frameless glass entry doors are located at both ends of the shower. A custom cabinet was added to display linens and accessories in the niche to the right of the fireplace. There are two fireplaces, both were concealed by walls prior to the renovation. The custom cabinets allow plenty of "his and hers" storage separated by open shelves for towels. The mirrors are mounted on functional shutters allowing the windows to open. Reflected in the glass you can see the custom tile feature wall located behind the bathtub. 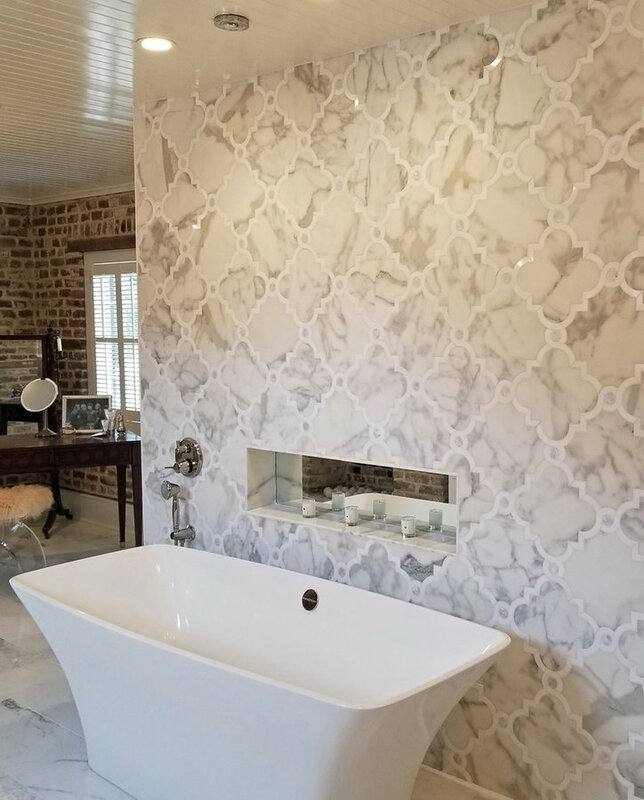 A custom tile feature wall with natural Thassos marble and mother of pearl accents is located behind the tub. 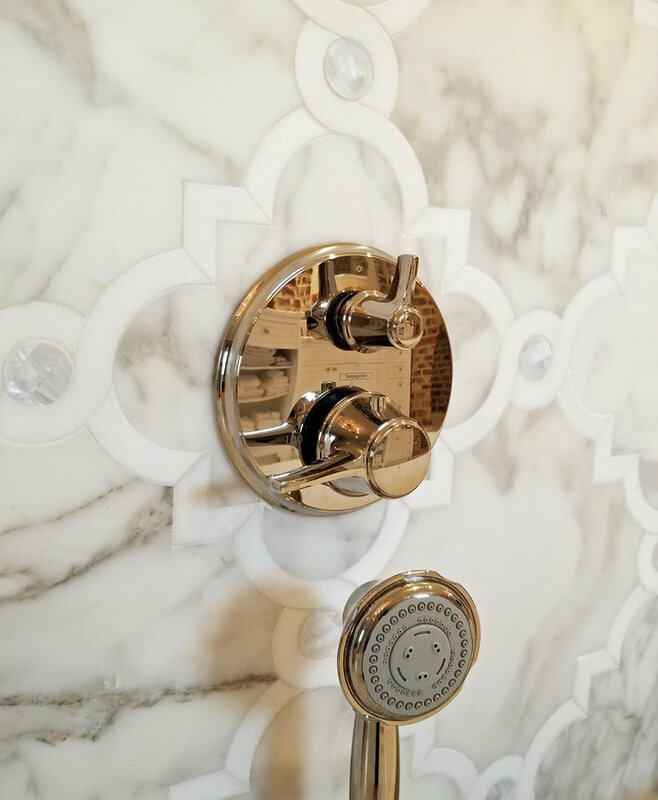 The valve shown here controls the water... which fills the bathtub from the ceiling, above the free-standing tub. A hand held spray is convenient to rinse away bubbles. 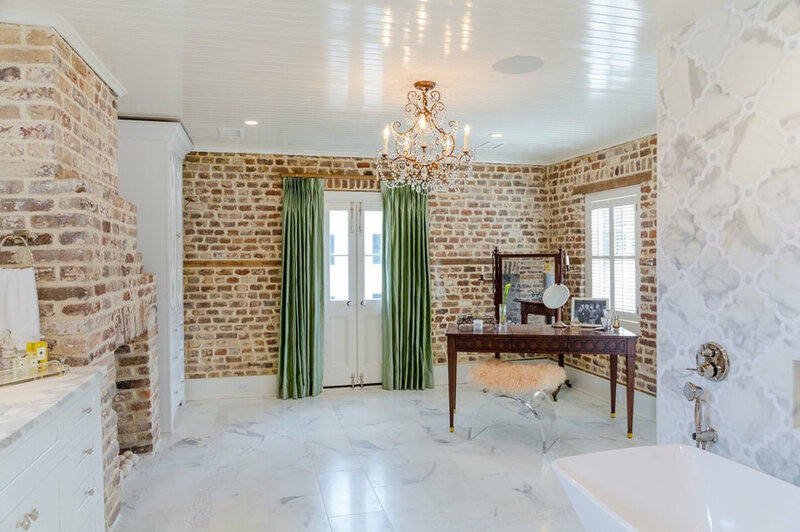 Circa 1794, this Historic home South of Broad in Charleston is located downtown. The original windows were fitted with shutters to match the period and style of the home as well as provide privacy. 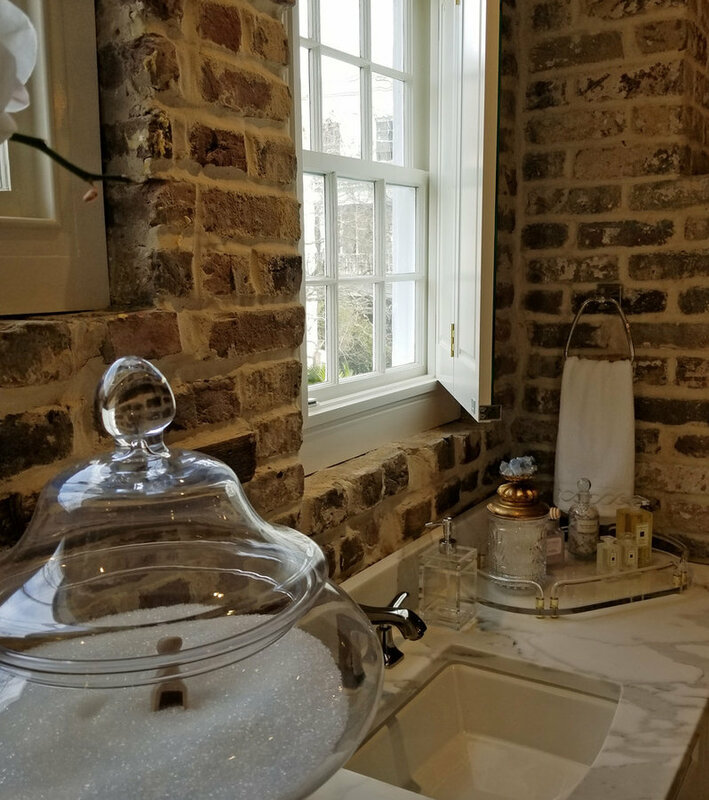 On the bathroom side of the shutters are mirrors, hinged to allow the access to the window and to allow more natural light. A custom bench provides a safe place to perch, at the perfect height. The linear drain is located near the back wall and the functional window has a frosted glass panel to protect the window. It's hinged to allow the access to the window. 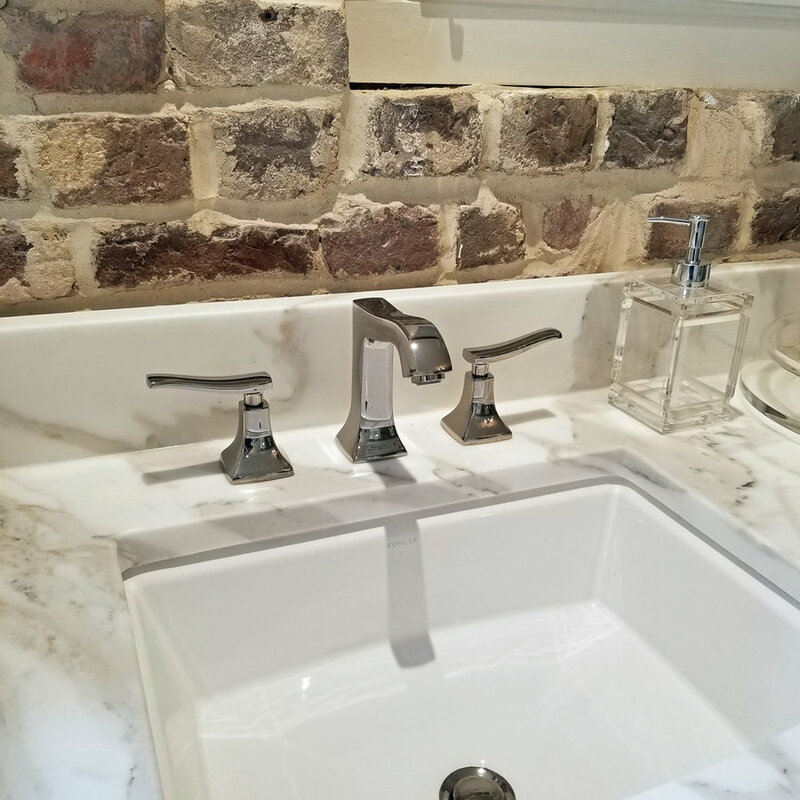 Graceful faucets and generous under-mount sinks for both. The doors replaced a smaller window and open to reveal a "Juliette" balcony and a view of the harbor beyond. 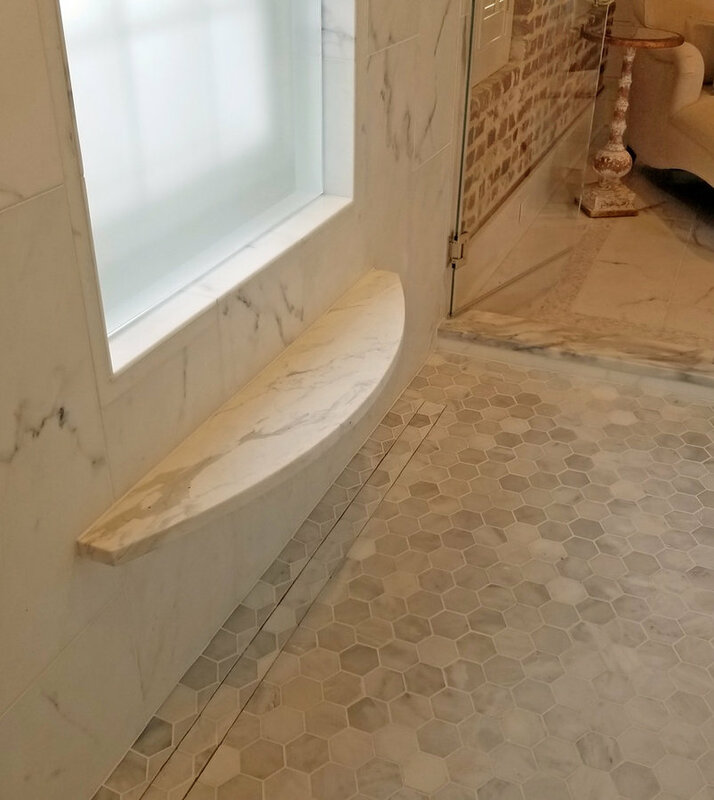 The marble floor features a mother of pearl inlay border and has electric radiant heat coils below. 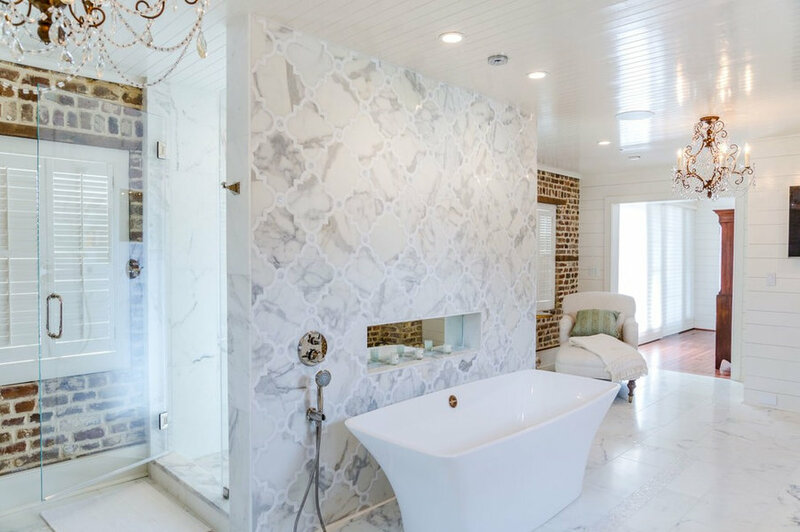 A custom tile feature wall with natural Thassos marble and mother of pearl accents is located behind the tub. The valve on the left controls the water... which fills the bathtub from the ceiling, above the free-standing tub. A recessed mirrored niche allows a resting spot for a glass of wine and candles to set the perfect mood. Custom Cabinets nestled between two fireplaces in this master bathroom retreat. The mirror is mounted on a functional shutter covering a window. 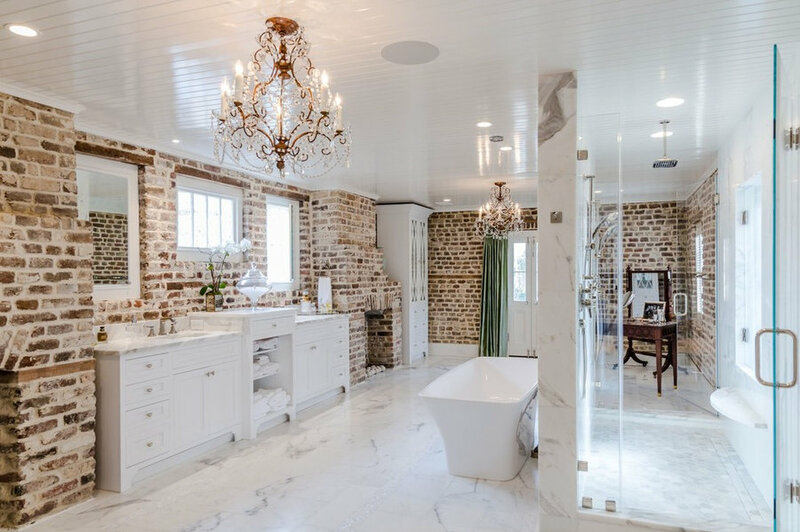 An elegant master bathroom retreat, marble tile and custom appointments. Photo by Kim Graham Photography, desk, chair and Curtains by Alison Baker Interior Design. Dual shower, heated floor, free standing tub among the luxurious amenities in this master bathroom. (Tub fill is in the ceiling!) Photo by Kim Graham Photography, desk, and chair by Alison Baker Interior Design. 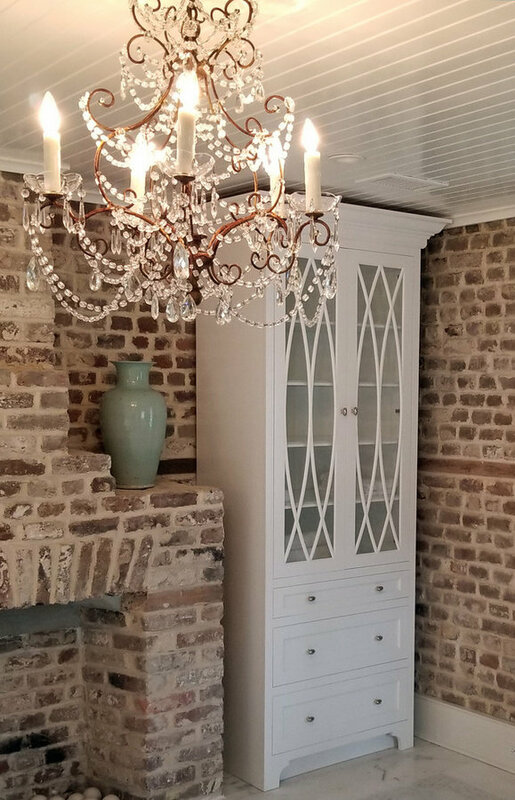 Dual vanities nestled between dual fireplaces in this historic home, Circa 1794 with exposed original brick. Photo by Kim Graham Photography. 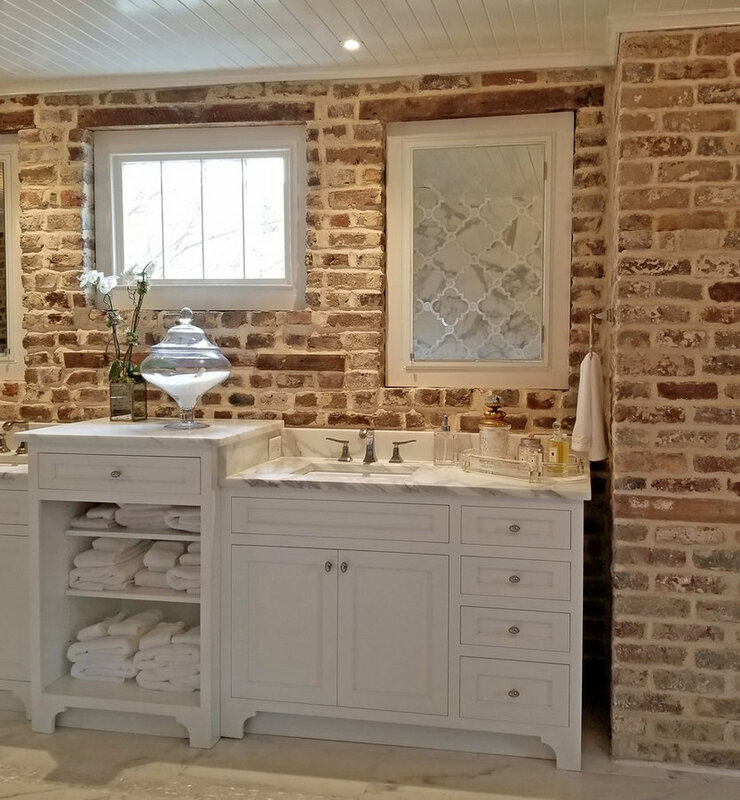 Dual vanities nestled between dual fireplaces in this historic home, Circa 1794 with exposed original brick. The shower features a rain head plus two hand held sprays, a fog-free mirror and his and hers niches. Photo by Kim Graham Photography. DAZZLING feature tile wall behind the tub.